During his second tour Hadrian visited Athens by AD 129 and from there he went on to Asia, then to Pamphylia, Phrygia, Cilicia, Syria, Cappadocia, Pontus, Antioch and Judaea by AD 130. Hadrian’s journey continued to Egypt and then back to Syria, Asia and Athens, eventually returning to Rome in AD 132. However, he was forced to return to Judea from AD 134 to 136 to quell a revolt. To commemorate these travels a large series of coins were minted. Amonst these were a series with the reverse legend ADVENTVI AVG followed by the name of the province visited, for example ADVENTVI AVG BITHYNIAE. The reverses always show the emperor left being greeted by the personification of the province concerned. The personification is holding a patera above a flaming altar but the dress and other attributes of the personification vary according to tradition. Thus Bithynia is depicted with a towered headdress and holding a rudder upwards in the left hand. There is an ADVENTVI AVG BRITANNIAE recorded (RIC 882) but RIC is unable to provide a description of the personification of Britannia. In fact, this coin type is very rare. The British Museum does not have an example and I have only been able to find two illustrations. 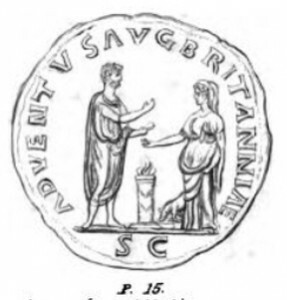 The woodcut shown below is from Akerman’s Coins of the Romans related to Britain and an illustration of an actual coin is shown on Guy de la Bedoyere’s website – here. Quite often worn examples of this series are mistakenly identified as the BRITANNIAE type, particularly if partial remining legends look as if they might have been BRITANNIAE. The BITHYNIAE, HISPANIAE, MACEDONIAE and MAVRETANIAE types are the usual suspects. These errors are compounded by the fact that RIC does not give a description of Britannia and that the ADVENTVI AVG BRITANNIAE coin type is listed in Spink’s “Coins of England and the United Kingdom” annual handbook without an appropriate warning that more common very similar coins exist that are not “extremely rare”.